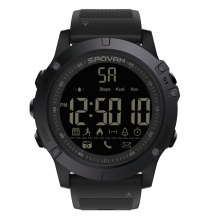 This digital watch is a great gift for those who love sports. Sports tracker: Steps, calories, and distance; 15 days history record. Sync time, alarm clock, sports data with App via BT4.0 connection with the phone. Smart reminder: Incoming calls, messages, App notifications (QQ, Facebaook, Twitter, etc.). Languages: English, Italian, French, German, Russian, Spanish, Portuguese, Arabic, Japanese, Korean. Long standby: Replaceable CR2450 battery lasts for 14 months under standard mode, 24 months under energy saving mode.